What once used to be the tallest white cedar tree in the world was on Michigan’s own South Manitou island. Over the past summer I explored the island and learned a lot more history than I thought I would. While I was there, I learned what Michigan was like before people turned it into the state we know today. On South Manitou island, there are many white cedar trees, but there aren’t near as many as there was in the early 1800’s. 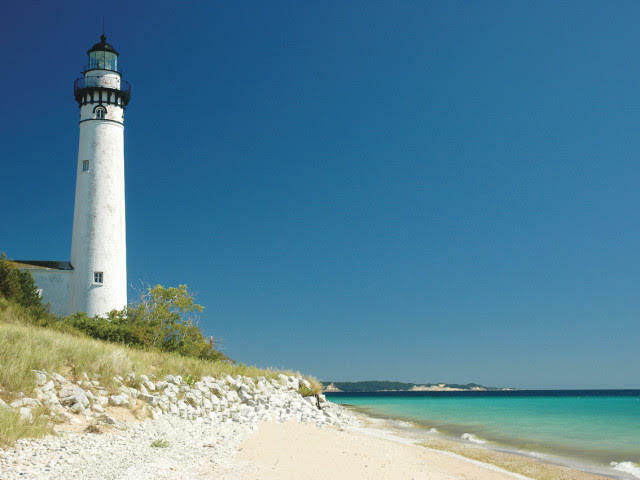 South Manitou island was first settled in the mid-1830’s, and many white cedars were cut down to use as fuel for steamships on the Great Lakes, and for buildings. On South Manitou there are only a couple houses and buildings, there are two houses near the ferry docks, and there is a lighthouse that was used for the steamships out on the water. The island is not free to build homes on, the island is a national park. Also, on the island there are designated campsites, so people can also camp on the island. The small white cedars were easy to cut down, but there was one big tree that was more difficult to fell because the teeth on the saw blade would dull super quickly. So this tree was just left to stand tall. The tree stood for years until the top half was brought down by a storm on the island. Today, you can still see the stump and it is between two and three feet wide. When it fell, the tree stood 18 feet tall and held the world record for the tallest white cedar. The tree that currently holds the record for the world’s tallest white cedar is in New York State. While on South Manitou, one can learn what a piece of our state was like when the first settlers landed. There is a lot of recreational activities to do on the island. It’s just as fun to learn what people did back then in the 1830’s, and to see the cedar that once held a world record.